Harper Wilde is sitting on the beach, minding her own business when a huge, muscular Kindred warrior with black hair and blazing white eyes demands that she accompany him into the future. Harper has no choice--she is dragged against her will into a dystopian nightmare--the world as it might become if something isn't changed. As a ten'sora, she is of special interest to the Hive, an insectile race of beings bent on taking over the Earth. By using her, they can conquer both the Mother Ship and the human race. Unless she herself is altered so the Hive cannot make use of her, the grim future Harper finds herself in will become reality. Shad is a Shadow Twin--a Kindred male destined always to walk alone with very little chance of forming a bond with a female. Yet, he alone is able to make use of the looper--a time travel device which allows him to move back and forth between the past and the future to try and save Harper. Falling in love with her isn't part of the plan but the big Kindred can't help himself. But he knows he must put his feelings aside and do what is necessary to change the past…unless he wants the future to Vanish forever. I started reading the Kindred series many years ago, and not once has any of the books been anything but awesome. This may be the 21st book of the series yet it’s still new and fresh. It’s a self-contained story but does have a background story through the treads of others in the series. Lots of action and adventure throughout. Well written and extremely entertaining to read. Love this series and the creativity of it!! 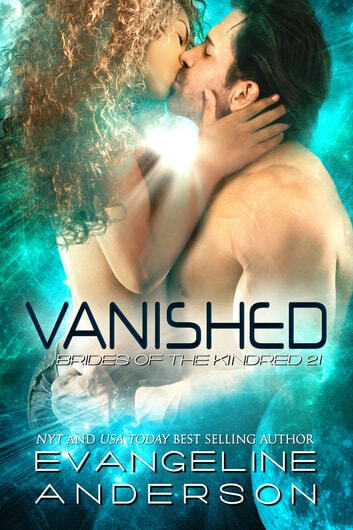 **Received ARC from Booksprout for a fair and honest review** Vanished is the 21st book in the Brides of the Kindred series. This book can be read as a standalone- the author gives you more than enough information that you don't feel lost. Since I've read all the other books, I feel like you would miss out since there are returning characters that you don't know. Just my personal opinion. I was so excited when I saw that this was going to be Shad's story, since he's the shadow twin and him, war and peace are still rather young, this was very much a surprise, but a welcome one! This book does not disappoint! I really enjoyed Shad, though Harper was annoying, self-centered/selfish at times, but overall it didn't really detract from the book. Be forewarned, this book is a rollercoaster, and there are a few surprising plot twists that I rather enjoyed! The authors imagination and creativity in these books really appeals to me and keeps me coming back for more! I can't wait for the next book in the series!! Hope this helps! Happy Reading!!! I received a free copy of this book via Booksprout and am voluntarily leaving a review. I love these books and it is quite a switch from the regular Brides of Kindreds. I like all the detail written in all the situations as well as in all the books. I am so glad Shadow had a happy ending. I highly recommend reading this latest book. The others are a must to read to. I received a free copy of this book via Booksprout and am voluntarily leaving a review. What a wonderful lead in to the Kindred Children's stories. We've already learned about Shad's gift of talking to the Goddess, and how he's able to know things that seem unlikely, but seeing all that he goes through for his family and Harper makes things even more real for him. Shad, the Shadow twin from Deep Lock and Kat's triplets, has been through hell fighting over and over again trying to save Harper and his species. The Hive took Harper and bred her and eventually defeated the Kindred and took over Earth. Shad is trying to change the past, but is desperate not to grow more attached at the same time. I love how protective he is of Harper, but I feel so bad for both of them knowing what's in store for them both. I cannot wait to see what happens next with both the Kindred and the Kindred Children. The lead in for the next books are making me anxious already and I cannot wait to see how things work out for them. A little worried about the future though, things look a little hairy for the future! This was quite a different Kindred tale set in the future, well a possible future as the past needs correcting. I hate those Hive critters and was glad of their outcome....or was I? All is never as it seems. Shad must go back to the past to save this woman who would become a breeding Queen. Time and time again he has failed and this is the last possible chance. I was hooked from the beginning and couldn't put this story down. As the book drew to a close I thought no way and then wow didn't see that coming. I highly recommend this story.